Whether you struggle to get up in the morning or you fight the afternoon slump a few hours before heading home from work, you know it can be tough to keep your energy up. Instead of reaching for an energy drink, which can be hard on your heart and bad for your body, try looking for natural energy boosters in the food you eat. According to a recent study, drinking a 32-ounce energy drink could cause harmful changes in your heart function and blood pressure in a way that caffeine alone doesn’t. That’s good news for us coffee and tea lovers, but should be a warning for people who look to energy drinks to give them a boost. The study, published in the Journal of the American Heart Association, states that generally, 400 milligrams of caffeine in a day — about five cups of coffee — is safe. But the average energy drink contains 320 milligrams of caffeine plus four ounces of sugar, multiple B vitamins and other ingredients intended to boost your energy. That’s a lot in one sitting. Researchers monitored subjects for 24 hours after they consumed energy drinks via electrocardiogram (ECG or EKG). The ECG test showed sometimes life-threatening heartbeat irregularities after subjects drank energy drinks. The same did not happen when they drank a caffeinated beverage alone. Subjects’ blood pressure also normalized far quicker if they consumed caffeine only, rather than an energy drink. So, if you want to protect your heart and prevent potentially life-threatening side effects, steer clear of energy drinks and try some of the following foods instead. You can get 88-percent of your daily value of manganese from one cup of brown rice. This trace mineral helps turn carbohydrates and protein into energy. It’s also an important component of an enzyme called superoxide dismutase, which is found in the powerhouse of cells, the mitochondria. Manganese can not only boost energy but also protect against free radicals in the process. Refined carbohydrates are a no-no when it comes to needing an energy boost; they burn too quickly. But complex carbs like those in sweet potatoes release glucose into the system slower, giving you a slow, steady supply of energy. They’re also rich in nutrients including vitamin C, magnesium, iron and beta-carotene that help keep you energetic throughout the day. Honey has a long history of uses for a natural energy boost. Ancient Olympians reportedly used honey to give them more energy before the games. Honey can help prevent muscle fatigue and gives you a long, slow burn of energy thanks to its natural fructose levels. Carbohydrates, vitamin C and fiber make bananas a great energy-packed snack. Add some organic peanut butter or almond butter to the snack, and you’ve got a combination of protein and carbohydrates that will carry you through a long afternoon of work. Just like Popeye ate spinach before a fight, you might want to nosh on a spinach salad a couple of hours before your workout. Its iron content can help boost your energy. In fact, if you find yourself lacking energy on a regular basis, it might be due to an iron deficiency, although you should talk to your doctor about that before jumping to any conclusions. 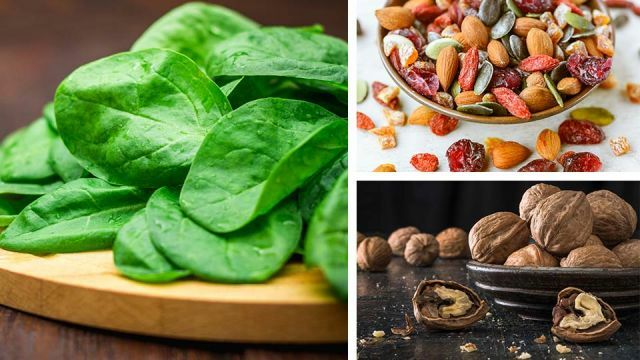 Spinach can help keep those iron — and energy — levels where they should be. The fiber content in beans makes them a great source of sustained energy. Since fiber takes longer to digest than other nutrients, it helps extend the energy production of the carbohydrates in beans. Magnesium in beans also helps the body to relax and restore energy, according to dietitians Lyssie Lakatos and Tammy Lakatos Shames. Almonds contain manganese, magnesium, vitamin B2, vitamin E and phosphorus, among other nutrients. Magnesium helps the body produce energy from food and supports the immune system. The fiber and protein in almonds also help keep blood sugar levels stable, meaning you’ll avoid a sugar crash after your snack. They can also help keep you feeling full for longer, reducing the heavy feeling that too much food can give you. Dehydration can sap your energy levels quickly, so foods with high water content — like melon — can help you stay hydrated, especially during warmer months. In fact, watermelon is about 90-percent water, making it a great way to keep hydrated and energized. Hard-boiled eggs contain the amino acid tyrosine, which boosts alertness. There’s also six grams of protein per egg, which helps with energy levels. Not only that, but the egg yolk contains choline, a nutrient that supports memory function. With so many great energy and memory-boosting nutrients, eggs are one of the best ways to start the day off if you’re sluggish in the morning. Heart-healthy and great for your brain, walnuts provide the body with incredible levels of omega-3 fatty acids. Healthy fats help boost your energy level so they can give you a nice pick-me-up when you need it. What is your favorite energy-boosting food on our list? Hey Buddy!, I found this information for you: "If You’re Tired All The Time, Try The 10 Best Foods For Natural Energy". Here is the website link: https://www.thealternativedaily.com/10-best-foods-for-natural-energy/. Thank you.